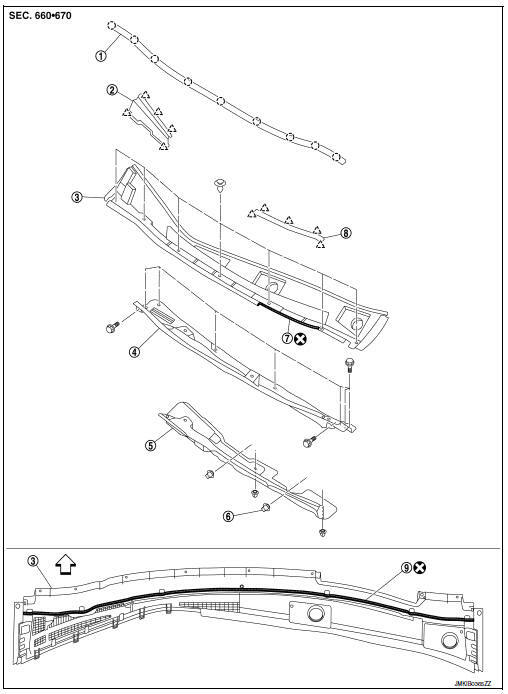 Remove front wiper arms (LH/RH). Refer to WW-57, "Removal and Installation". Remove front fender covers (LH/RH). Refer to DLK-159, "Exploded View". Remove front fender seals (LH/RH). Refer to DLK-306, "Exploded View". Remove cowl top cover clips. Pull forward to release cowl top cover from windshield glass. When performing the procedure after removing cowl top cover, cover the lower end of windshield glass with urethane etc. Remove the following from the cowl top cover. Clean the joint between the cowl top cover and the windshield. Replace the EPT sealer on the back surface with new EPT sealer when reusing the cowl top cover. Remove the EPT sealer remaining on the cowl top cover using a double-faced adhesive tape remove. To maintain adhesion, do not wash the vehicle within 24 hours after installation. 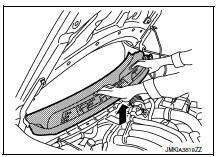 Perform the stop position adjustment at the installation of the front wiper arms. Remove front wiper drive assembly. Refer to WW-62, "Removal and Installation". Remove cowl top extension bolts and cowl top extension. Remove cowl top extension insulator clips and cowl top extension insulator.